Make a list of any and all vegetables you DO like. I don’t care if you like them ONLY a “certain way” or “in certain things”. Make a list of the vegetables you’ve actually TRIED, but hate. Some folks will say they hate “xyz”, but have never even tasted it. Those don’t count… only the ones you’ve actually tasted before. Once you’ve made that list, think back to when you tried it. Close your eyes if you have to, but really take yourself to that time and place when you tried the vegetable(s). -What didn’t you like about it? Try the vegetables prepared differently. If you find that when you tried broccoli or spinach that they were too mushy, try lightly steaming, roasting or even eating raw. I, personally, have found that I like broccoli (something I HATED as a kid) when it’s NOT boiled, but rather either sautéed in a pan with butter, garlic powder, a little soy sauce, sea salt, and pepper or… tossed with the same things I just listed, but roasted in the oven on a baking sheet. Mmmm! So, try a different method of preparation and you may find one you like or even… *gulp*… love! As a kid, my mom made me a lot of canned veggies. Some were fine, like the green beans, but spinach out of a can was GROSS! But I do like it fresh or even frozen. In fact, I never buy canned veggies, as I feel they lack any or most nutritional value. Frozen is better than canned… but FRESH is best of all, even if you do end up cooking them some sort of way! Try them with a dip or sauce. Listen, if ranch dressing, cheese sauce, hot sauce, or whatever will get you to eat the darn veggies; then do whatcha gotta do to eat the darn veggies! Your body can and will still benefit from them. Now what you CAN do is try to make whatever you’re dipping or covering them in as healthy as possible OR… try weaning off of the dips, sauces or dressings by using less and less each time you eat them. I’m not a huge fan of bell peppers. I will NOT eat them raw, as I would carrots or celery. I will NOT eat them stuffed, nor on the side of any dish. But I WILL eat them chopped and whipped up into an omelet, in spaghetti or chili, or on a pizza. So you may find that, while you don’t like them alone, you may like them IN or ON something. I’ve heard some folks say that the flavor of organic tastes better than conventional. I do recall getting two bunches of bananas – one organic and one conventional – and yes, it did seem that the organic ones were richer in flavor. So, the same may be possible with vegetables, so try it and see if it makes a difference to you! Now, let me forewarn you – carrots, IMO, do NOT taste good in fruit smoothies! I’ve tried multiple times and it always ends up making my smoothie taste “meaty”, as in meat-flavored. Don’t ask me how or why, it just does… even my eldest son said the same. But more so vegetables such as greens (spinach, kale, parley, etc.) can be blended with fruit and whatever else you like in your smoothies. Start with small amounts and overtime, work your way up to adding more. Juicing is probably going to be one of THE best ways to get your veggies in! If you don’t have a juicer, you can use a blender – here’s how to do that. If you don’t want a savory, “V-8 type” juice, be sure to juice the veggies along with fruit such as apples, pears, etc. to sweeten and make more palatable. You may also want to add some lemon juice as that will cut some of the strong flavors that some vegetables produce. Sometimes you just need a “reboot“. Have you ever seen the documentary, “Fat, Sick, And Nearly Dead” where the guy reversed an autoimmune disease he had AND lost a ton of weight by going on a juice fast? I know that when my family and I were raw fooders, I found myself (as a result of eating mainly fresh fruits, vegetables, nuts and seeds) beginning to like vegetables that I hated as a kid! It was like my tastebuds changed and were more accepting of the flavors they once loathed. So, consider doing something like a green smoothie or juice cleanse for about 7 days or more and see if that helps you appreciate vegetables a bit more! 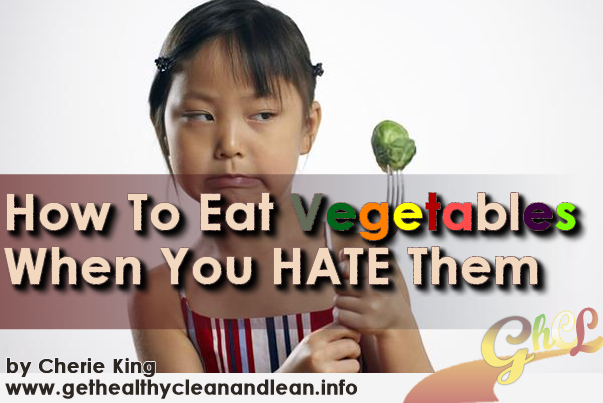 Well, those are some ways to possibly get yourself to eat vegetables even when you hate them! Hopefully one or more of them will help you to begin eating more veggies! If not, consider taking a daily vitamin supplement so that your body can get any nutrients that you may be missing out on by not eating your veggies.